The Cdks are serine/threonine protein kinases which are predominantly involved in the progression of the cell cycle. Subsequently, CDK-cyclin complexes (CDK7, CDK8 and CDK9) were also identified as regulators of transcription. 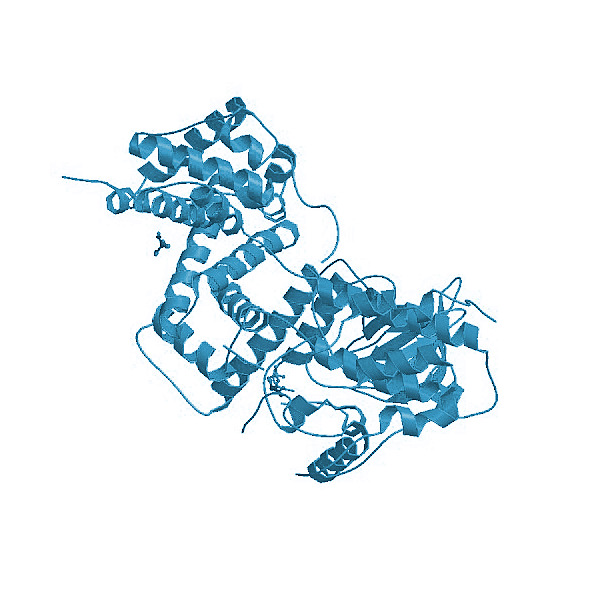 CDK8/CycC is part of the RNA polymerase II holoenzyme complex and phosphorylates the carboxy-terminal domain (CTD) of the largest subunit of RNA polymerase II. On the other hand, CDK8/CycC phosphorylates cyclin H, a component of the CDK activating kinase (CAK), and represses activated transcription by modulation of TFIIH activity. Human cyclin-dependent protein kinase CDK8, coexpressed in complex with with human CycC. Pinhero R, Liaw P, Bertens K, Yankulov K. (2004) "Three cyclin-dependent kinases preferentially phosphorylate different parts of the C-terminal domain of the large subunit of RNA polymerase." Eur J Biochem. ;271 (5):1004-14. Leclerc V, Leopold P. (1996) "The cyclin C/Cdk8 kinase." Prog Cell Cycle Res. 2:197-204.